"Malok! Listen — I took you from your mother, my sister / Your shape is new / This shape is poison — the shape of secrets / I name you Malok, which means My Poison / A prize to taunt sister Savathûn / Steal now for me." Malok, Pride of Oryx is a Taken Prince and a son of Savathûn, the Witch-Queen who rises to power in the aftermath of the defeat of Oryx, the Taken King, becoming a prime candidate to seize Oryx's vacant throne, thus serving as the main antagonist of the April Update. He is first encountered in the Story Mission "Pretender to the Throne", where the Guardian tries to stop Malok from occupying the throne. He is met again in the Blighted Chalice Strike, where he plans to roost a nest of Taken and lead them on a full-scale assault on The Last City. A fireteam of Guardians pins him down there and finishes him off for good. Originally an unnamed Thrall, Malok was begat by his mother to turn against the Taken King himself by tithing upon his tribute to fuel hers under the cloak of deceit and cunning. Her ploy failed as he selfishly took Oryx's tribute for himself instead and grew in strength till he became a Knight and eventually a Prince. Unfortunately Malok's thievery was known and ultimately became Taken by Oryx to taunt his sister; Given his aforementioned name (meaning My Poison in the Hive tongue) in mockery of her failed machination. Malok was sworn into his uncle's court albeit retaining some of his will until the latter's demise by the Guardians. 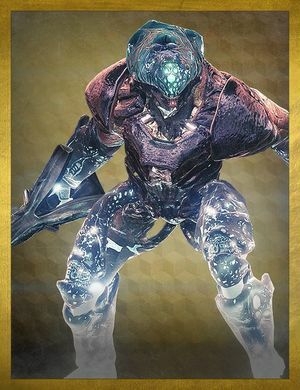 Unlike most Taken, which exude blights wherever they go, Malok was able to control the Taken Blights at his disposal; empowering them at his command and becoming formidable enough to taking claim of the Osmium Throne. However, before he could perfect his work with the blights, Variks summoned the Guardians to capture Malok for his Prison but Eris Morn pressed that Malok had to be killed to prevent anyone from claiming Oryx's throne. Malok was driven out of the Dreadnaught and into the Hellmouth, to the Shrine of Oryx. There he was confronted by the Guardians who killed Oryx and was himself defeated. Malok is encountered twice in the April Update. He is first met in the mission Pretender to the Throne on the Dreadnaught, where he plans to threaten the Guardian upon their arrival. To show his might, he sends forth a wave of Taken to fend off the Guardian. The Guardian succeeds, but Malok teleports to the Shrine of Oryx to secure his power. The Guardian confronts him again in the Blighted Chalice strike, and he has some deadly tricks up his sleeve. His mere presence covers the floor in a dark mist that disables recovery and agility, and throughout the fight, he will continue to summon Taken Blights. These blights will bring forth waves of Taken minions that should be disposed of quickly. Destroying the blights will also clear up space for Guardians to gain a foothold on the battlefield. Like most Knights, Malok is armed with a Boomer that rapidly fires fast-traveling Arc Bolts that deal high explosive damage, so he can constantly siege and overtake your position even when you're hiding in cover, and if a Guardian gets too close, he will pound the ground with his fist to create a gigantic shockwave that will instantly kill them. He is capable of moving blindingly fast as well, making it tricky for the player to keep their reticle on target. However, after sustaining enough damage (approximately 75% of his health), Malok drops his Boomer, thus signifying a change in his tactics. His first attack is an ability typical of Taken Knights: sending forth a barrage of Solar projectiles that linger on the ground, creating a fiery trap that rapidly drains the health of Guardians who step in them. He uses this attack very often; it has a very long reach, and the "Shadow Touched" debuff he casts on the floor makes it all the more difficult to avoid. The best defense from this attack is to find adequate cover. After reaching a certain health threshold (approximately 45% to 50%), Malok will begin sending out Axion Darts like those of Taken Centurions. They are quickly and constantly fired in different directions and can unpredictably bounce off of and move around corners to track their targets, and should they all manage to home in on your fireteam, they will quickly cause a team wipe considering that Malok sends them in clusters of four. These darts must be destroyed in order to reduce or, better yet, eliminate the chances of dying from homing, long-ranged attacks. This change in tactics makes Malok a very dangerous foe, and therefore should be engaged with caution, as he doesn't even need to get close to score a kill. Malok was first identified by two items added to Destiny's database by The Taken King: the Pulse Rifle Grasp of Malok, which drops from the Will of Crota Strike, and the Strike-exclusive Hunter Helmet Hood of Malok. The killcam shows that Malok belongs to the Hive sect Blood of Oryx even though he his Taken. This may be a developer oversight. After losing his Boomer and dealt enough critical damage, Malok's gel-like head will swell and eventually burst. Malok is the second Strike boss in the Destiny universe to have changing tactics in-game, the first being S.A.B.E.R.-2. Malok is one of the only Taken enemies in Destiny who possess independent thought. Malok performing a Fist of Darkness.